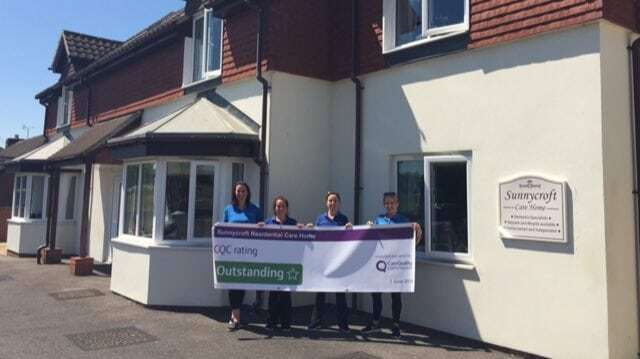 Staff and residents are celebrating at Sunnycroft Residential Care Home in Hampshire after being rated Outstanding by the CQC. The home, which provides care for up to 32 people, joined the 2% of services rated Outstanding, following an inspection in April. Owner Nick Hawkins told CHP: “I’ve always known that Sunnycroft has a fantastic team of people, who are greatly appreciated by our residents and their families. It’s wonderful that all the hard work has now been recognised by CQC. The CQC commented: “People, relatives and staff expressed an extremely high level of satisfaction and confidence in the leadership and management of the service, rating it outstanding in the most recent survey. The CQC said the home was “exceptionally well led” with all staff understanding and embracing the values and vision of the provider and manager. Inspectors also praised the “culture of learning” at the service with incidents and accidents being investigated robustly and learning shared with the team to prevent recurrence. Staff were also given a very good level of training, supervision and appraisal to ensure they had the skills and knowledge to deliver effective, person centred care, the CQC said. Home manager Anna Edwards added: “I couldn’t be any more delighted with our homes achievement. I have worked within the care industry for over 24 years, 14 of them at Sunnycroft and am fortunate enough to work as part of a talented, fun and motivated team that is dedicated to making a positive impact on our service users lives.